One of Lula’s most powerful statements when he became Brazil’s President, in little more than 20 words, is for many the greatest legacy of his government. “We need to overcome hunger, poverty and social exclusion. Our war is not about killing people: it is about saving them.” That was the promise of the former president, who ended his two terms in power having removed almost 30 million Brazilians living below the poverty line. 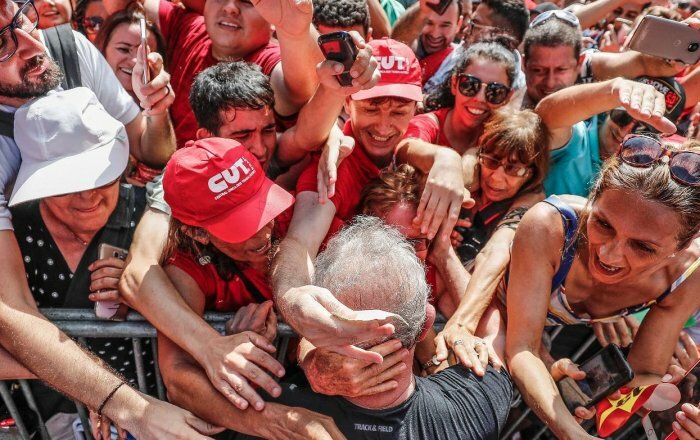 This achievement, recognized by the Brazilian people and celebrated worldwide, is precisely what motivated the Argentine Adolfo Perez Esquivel to carry out a campaign to include Lula in the list of people running for the Nobel Peace Prize. This was the initiative of a man whom himself took the honor in 1980 for his efforts in human rights activism and for his fight against the dictatorships then present throughout Latin America and the campaign was released on April 5 last year, two days before the former president was taken to jail for a crime he has never committed. Since then, the petitioner has already collected more than 430 thousand signatures, but to achieve what Adolfo set out to do it would be necessary to gather, before next January 31st, signatures of individuals who fit the criteria stipulated by the organization – such as university professors or key personnel of a peace research institute. With the same sense of hope Martin Luther King conveyed when he said, “Even if I knew that tomorrow the world would go to pieces, I would still plant my apple tree” there are many who believe that the Nobel Peace Prize for Lula will help with the efforts to see a new dawn to shine on that ‘tree of life’, justified Esquivel in the letter to the Committee that organizes the awards. Esquivel’s statement echoes what the prize organization itself thinks and expects from competitors. According to Nobel’s will, the Peace Prize shall be awarded to the person who in the preceding year “shall have done the most or best work for fraternity between nations, for the abolition or reduction of standing armies and for the holding and promotion of peace congresses”. .In this regard, Lula has earned the right to be among the finalists for the Nobel Prize. 1. According to the Brazilian Institute of Geography and Statistics, there was close to a 50% reduction in the unemployment rate, and the creation of 15 million new jobs according to data from the Ministry of Labor and Employment. 2. According to the Institute of Applied Economic Research (IPEA), the Brazilian Gini coefficient was 0.583 in 2003, and in 2014 it was 0.518, indicating that the social policies implemented by the Workers’ Party (PT) helped Brazil to decrease social inequality, as average inequality fell by 0.9% per year, in the period 2003-2016. 3. The implementation of education and public health programs has raised the Human Development Index (HDI) of Brazil. In 2010, the average annual income reached US $ 10,607, a life expectancy of 72.9 years, 7.2 years of schooling and a school life expectancy of 13.8 years. – members of national assemblies and national governments (cabinet members or ministers) of sovereign states, as well as current heads of state;- members of the International Court of Justice in The Hague and the Permanent Court of Arbitration in The Hague;- members of the Institut de Droit International;- university professors, emeritus professors and associate professors of history, social sciences, law, philosophy, theology and religion;- university rectors and university directors;- directors of peace research institutes and foreign policy institutes;- people who received the Nobel Peace Prize;- members of the main board of organizations that received the Nobel Peace Prize;- members, former members and former advisers to the Norwegian Nobel Committee.